New Winter Apparel is here! Home › The Run Down › New Winter Apparel is here! We all have some kind of weather that will trap us indoors when we were planning to go for a run. Fortunately, whether it's too wet, too cold, too windy, or too stormy to run, there is an apparel piece that will help get you out the door despite the weather. We have a few wonderful new apparel pieces at Fleet Feet Tacoma, including a waterproof rain shell from Helly Hansen, an Adidas jacket comfortable and durable enough for a run yet stylish enough to wear on a night out, and wool socks, warm gloves and mittens, scarves, and hats to keep all of your runs comfortable through the winter. If getting wet is what stops you from running, this is the apparel piece for you. Personally, a nice lightweight rain shell is probably the best running investment I've made besides quality running shoes. With something to keep me dry, what was once a run I dreaded and put off, is now a run I'll readily jump out the door for. The Loke Jacket is waterproof, windproof and breathable and has all of the features you could ask for in a waterproof running/hiking shell. It's got zip open armpit vents, adjustable cuffs, a bill on the hood to keep rain out of your eyes, and a bright color to make you visible under the dark clouds. Plus, at a flat $100, its a better bang for your buck than most rainjackets I've seen out there. Pair it up with a cozy base layer and go conquer that storm! Just looking at this running jacket, I would think it was something to wear on a night out with some friends, but the Hoodstooth is just as comfortable as it is good-looking. It's got thumb holes to keep the sleeves in place, hidden pockets, strategically placed Adidas Climalite fabric to wick moisture from the skin, reflective details on the back and arms, and (perhaps my favorite feature) a partial zipper at the back for an adjustable waist. The Paramount Jacket is a go-to for skiers and boaters all over the world, though it serves more purpose than that. It is a softshell that is warm and protective enough to withstand a light drizzle and icy winds, yet stylish enough to wear at your favorite bar. This magical outfit will keep you both warm and highly visible on cold, dark night runs. 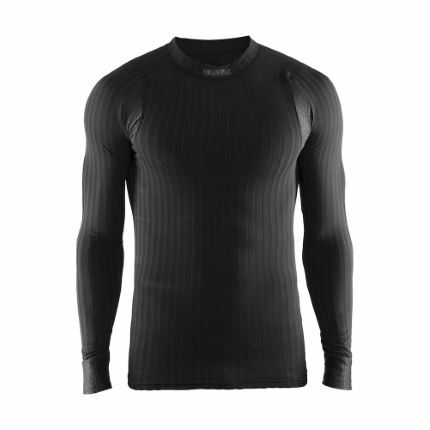 The Craft Active Extreme base layer keeps you warm even below 50 degrees while being incredibly lightweight, breathable and flexible with Craft Coolmax Air thermo regulation and the tights are completely reflective from bottom to top. Both pieces are available at Fleet Feet Tacoma in men's and women's. These are just a few of our favorites here at Fleet Feet Tacoma. We have countless more options, so be sure to stop in, try some on, and ask all sorts of questions. Our fit experts are here to help you learn about the best running products available for your particular needs.